So now it is okay for David “camera” Hogg to insult war heroes like Arizona Sen. John McCain? Hogg, Parkland shooting survivor who has become a high-profile anti-gun, anti-NRA, far LEFT advocate following the February 14 mass murder of 17 people, on Friday turned his attention to Sen. John McCain. He is the top recipient of National Rifle Association money in Congress. Hogg asked,”Why do you take so much money from the NRA?” Maybe it should be asked where Hogg and his anti-gun student advocates get their money from? So let;s understand this, Hogg, who has done nothing in his life thinks he has the right to question a war hero like John McCain? Really? Hmm, so its ok for Hogg to go after the 81 year old McCain who is currently battling a deadly form of brain cancer, called glioblastoma. David Hogg, the Parkland shooting survivor who has become a high-profile gun-reform advocate after the Feb. 14 mass murder of 17 people, on Friday turned his attention to Sen. John McCain,the top recipient of National Rifle Association money in Congress.”Why do you take so much money from the NRA?” Hogg, 17, asked in a reply to a McCain Twitter message about the Phoenix-area “Rio Reimagined” redevelopment project that was launched Friday. McCain’s office could not immediately be reached for comment, and McCain had not responded to Hogg’s question on Twitter. 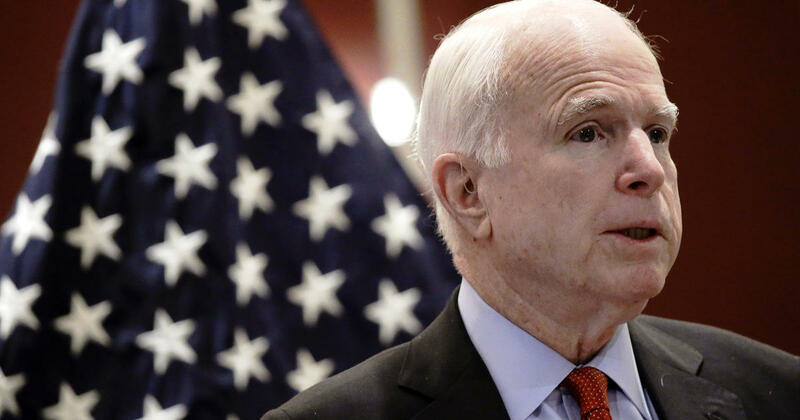 McCain, 81, is now battling a deadly form of brain cancer called glioblastoma. McCain’s health has kept him in Arizona since before Christmas and it is unclear when he will return to Capitol Hill. He is not expected to seek a seventh Senate term in 2022. This is what happens when you embolden those with no concept of anything. More high school stiudents are killed in automobiles ever year. Maybe Hogg should question those getting money from AAA? Sen. John McCain is returning to Arizona and will miss the final vote on the GOP tax passage expected this week. 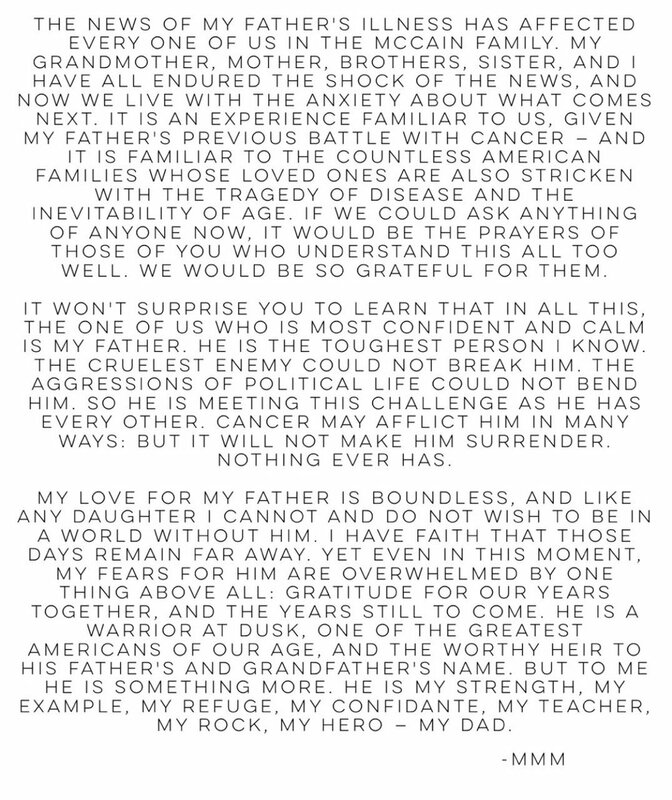 McCain is recovering from the side effects from chemotherapy treatment for brain cancer. McCain is expected to return to Washington in January. There are a currently razor-thin margin needed to pass the tax bill; however, McCain’s presence will not likely be the determining factor in the vote. It appears that the votes from Bob Corker of Tennessee and Marco Rubio of Florida will make McCain’s vote not needed. 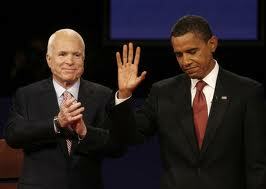 I am sorry, Sen. McCain needs to retire and do the best thing for him, his family, his country and his Party. The man has brain cancer, things are not going to get better, they will get worse, much worse. Being a Senator is not a life-time appointment like the SCOTUS or Pope. If you can’t do the job required, anyone in politics needs to retire. The Senate is bigger than any one individual and its time that John McCain spend the remainder of his days with family and loved ones instead of holding a political party hostage wondering whether he can made a vote or not. 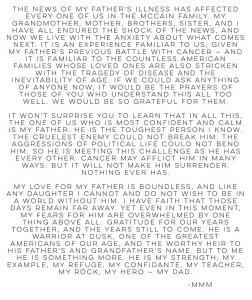 Please Sen. McCain, do the right thing, be a hero again. Republican Sen. John McCain returned home to Arizona after spending several days in a Maryland hospital recovering from side effects from chemotherapy treatment for brain cancer, CBS News has learned. He will spend the holidays with his family and will not be on hand for the final vote on the GOP tax passage expected this week. He’s expected to return to Washington in January. Late Sunday, a dual statement from McCain’s doctor and his office described the senator’s current health situation. SENATE FAIL … ATTEMPTS TO REPEAL AND REPLACE OBAMACARE FAILS, A POX ON BOTH YOUR HOUSES!!! Overnight, the U.S. Senate blocked the latest attempt by the GOP to repeal Obamacare. The so-called Skinny repeal failed by one vote as three Republican Senators voted “no” to the bill. And just who were the three GOP lawmakers who blocked the bill? It was RINO’s Susan Collins of Maine, Lisa Murkowski of Alaska and John McCain of Arizona in a 49-51 vote. UNREAL. Gee McCain, we are just so glad you returned to act a Judas. You should have stayed home. Don’t ever lecture us again, just go home and retire. Once again, McCain shows he would rather side with Democrats, than his own party and fulfill his promise to replace and replace Obamacare. Good riddance. RINO and liar Sen. Murkowski stated that she would not be pressured by President Trump. Hmm, how about pressured by what you told fellow Alaskans in your promise to repeal Obamacare (VIDEO)? Because God forbid these power hungry politicians tell the truth and not lie to get elected. SENATE FAILURE … YOU FAILED THE AMERICAN PEOPLE! A months-long effort by Senate Republicans to pass health legislation collapsed early Friday after GOP Senator John McCain joined two of his colleagues to block a stripped-down Obamacare repeal bill. “It’s time to move on,” he added after pulling the bill from the floor. The decision by McCain to vote no came after weeks of brinkmanship and after his dramatic return from cancer treatment to cast the 50th vote to start debate on the bill earlier this week. The GOP’s ‘skinny’ repeal bill was defeated 49-51, falling just short of the 50 votes needed to advance it. Republicans Susan Collins of Maine and Lisa Murkowski also voted against it. It wasn’t immediately clear what the next steps would be for the Republicans. The repeal effort had appeared to collapse several times before, only to be revived. And several Republicans pleaded for their colleagues not to give up, even as President Donald Trump blasted the vote. After 7 years of bitching and moaning about Obamacare and claiming they would repeal or repeal and replace Obamacare, in the end, it was all a lie. In 7 years the Republicans had no solutions, just lies to get reelected. All of you should be ashamed and the GOP leadership should step down and make room for individuals who can lead. As for the GOP Senators who broke their word to the American people that you would repeal it to get elected, you need to be primary challenged and thrown out of office. To the Democrats who sat on their hands and cheered as as if Obamacare is some great thing for the American people, you need to be voted out of office immediately. It is too bad that President Trump actually bought into the GOP swamps lies. Following the Skinny repeal fail Trump tweeted at 2:25 am Washington time: “3 Republicans and 48 Democrats let the American people down, As I said from the beginning, let ObamaCare implode, then deal. Watch!” And implode it will as it is already in the process of doing so. With the Obamacare repeal and replace, or just plain repeal vote looming on the horizon, Sen. John McCain (R-AZ) has returned to Washington, DC after recently being diagnoses with brain cancer. The vote is that close and that important. It is hard to imagine that Sen. McCain would make the trip back this soon after being diagnosed with a glioblastoma, a very aggressive form of brain cancer, if Sen. Mitch McConnell didn’t have the votes. But who knows at this point. After seven years of promises to rid the American people of Obamacare, it is time for the GOP Senate to step up to the plate and do their job. The American people have given the Republicans the House, Senate and Presidency to repeal Obamacare, as they asked. NOW, JUST DO IT!!! Senate Republicans are barreling toward a dramatic and highly unusual vote on Obamacare Tuesday without knowing whether they’ll have the votes to start dismantling the health care law. At stake is not just the seven-year-old campaign pledge to repeal Obamacare, but also demonstrating that Republicans — when given full control of Washington — can govern. Sen. John McCain (R-Ariz,), recently diagnosed with brain cancer, made it all the more dramatic Monday evening when he announced he would return to Washington for the vote. The vote is expected Tuesday afternoon after what is expected to be a rowdy Republican lunch. Senate Majority Leader Mitch McConnell is hoping to use McCain’s return and momentum from one final plea to his members at a Tuesday caucus meeting to push the required 50 votes into the “yes” column and open debate on repealing the law. Big day for HealthCare,” President Donald Trump tweeted Tuesday morning. “After 7 years of talking, we will soon see whether or not Republicans are willing to step up to the plate! Democrats feared the worst with McCain’s return.